Success in your competition takes more than a great body. Understanding the factors that make up a winner are vital in bringing your best to the circle. In differentiating between two competitors who have similar physiques, the judges need to take into account the details that makes one women stand out beyond the others. Below are tips to help you bring your A game on competition day. Do You Know How to Pose Effectively? Understanding what body features are your strengths and which ones are your weaknesses, is the first step to a perfect pose. Being able to showcase certain muscle groups to the judges will push you ahead of the pack. The best tip includes consulting with a coach who can show you how to pose. Try to choose one that has experience judging competitions to get insider information on what judges are really looking at. Find these professionals through the show contacts or in social media groups, where you can find recommendations for the best ones. Beyond your diet regimen and workout, finding a flattering bikini can nail your win in a competition. Competition suits are expensive, but this is an area where paying more is definitely worth it. Finding the right suit that accentuates your best body features is vital. Look for a suit maker with a good reputation and one that understands the business. Bikini bottoms are more important when considering accentuating your glutes. The right cut makes all the difference. Illusions by Aggie offers a beautiful array of stunning suits backed by 30 years of experience. The right color suit matters as well. It needs to compliment your hair color and skin tone. Remember to take into account what color your skin will be after you have applied a tan. Black hair tends to shine with red or lighter blue colored competition suits. Blondes should shy away from yellow toned suits as they can conflict with their hair color. Green is an appropriate color for olive-toned skin colors. 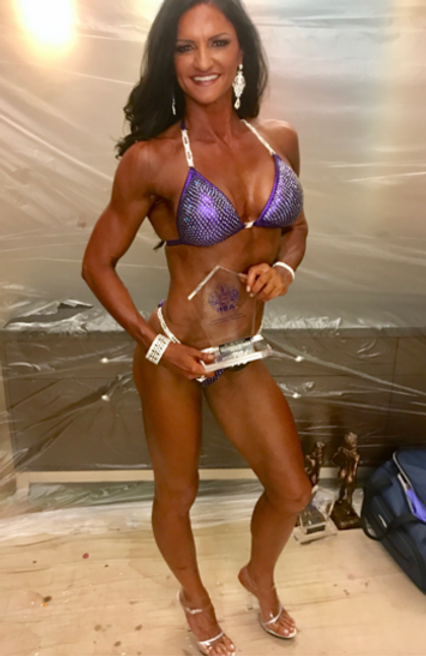 If you have doubts about the best color for you, research IFBB winners online and check out how they match their suit colors to their hair color and skin tone. Longer hair is often prized as luxurious, feminine and dreamy. However, longer isn’t always better. If the shape of your face would be better suited with a shorter cut, go with what works rather than choosing something that could take the judge’s attention away from the rest of your package. As with the other details you are working on, undoing all of that hard work with a poor hairstyle choice won’t get you on the path to a win. The best tip is to take care of your hair. Smooth frizziness, condition to make it shine and look healthy. This will always be a stand out feature to the judges. The lighting on stage will affect the color of your hair, so prepping beforehand will make a huge difference the day of the competition. Know what your hair will look like under the lights. Experimenting with different hairstyles prior to the competition can help you figure out which is most flattering. Take pictures of your styles and include quality extensions if desired to make your hair fuller or longer. Remember to match the extensions to your own hair color so the look is seamless. The easiest way to get the most out of your makeup for your competition is to hire an experienced and talented makeup artist. Research the best makeup artists with experience working with bikini competitors. Whether you take this step or not, here are some tips to consider. Consider that your skin will be tanned and select an appropriate foundation for your base makeup. Take into effect the way that the lights on stage will affect your makeup choices. Shimmery products don’t necessarily sparkle under the bright stage lights. A smokey eye isn’t always the best option for all. Swarvoski crystals and rhinestones glitter under the stage lights. Selecting the appropriate jewelry as well as the amount of jewelry adds a finishing touch to your overall package. Including heels that sparkle with crystals is a great idea to pull it all together. It should be said that it is possible to overdo the jewelry. Remember that you want to accent your other features, not overtake them. Hair clips, bracelets, rings and earrings are all appropriate, especially when coordinated with gemstones on your competition suit.